Special issue on "Computer Vision in Healthcare and Assisted Living", IET Computer Vision, The Institution of Engineering and Technology, 2017. 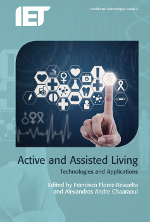 Book "Active and Assisted Living: Technologies and Applications", IET Healthcare Technologies Series 6, The Institution of Engineering and Technology, 2016. Special issue on "Ambient Assisted Living and Robotics", IEEE Intelligent Systems, IEEE, 2015. Special issue on "Ambient Assisted Living - sensors, methods and applications", IEEE Transactions on Human-Machine Systems, IEEE, 2015. Copyright © 2013 Francisco FlÃ³rez. All rights reserved. Original design by NodeThirtyThree + Free CSS Templates.